This u-channel is made with an electrostatic flocked rubber that is flexible and reduces friction to secure and allow the glass to slide quietly and smoothly inside the channel. Use where a mohair-lined channel is needed to eliminate rattle, and provide a smooth sliding surface to protect the glass. 7/16" tall and 7/16" wide. 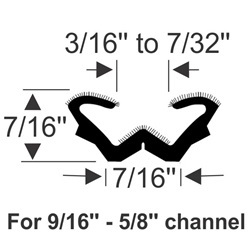 Designed for 9/16" - 5/8" channel. This product is sold in 96" strips. Ideal for 2007 Bayliner Discovery 246 boats.